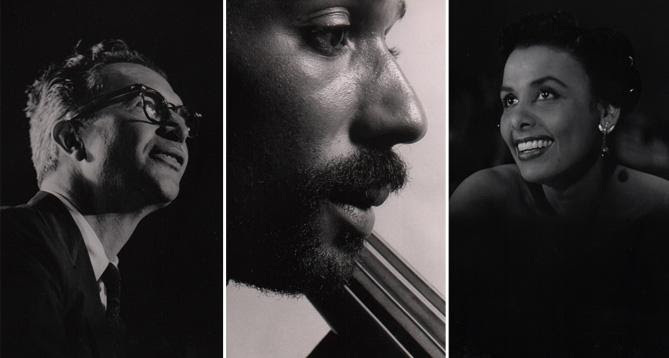 The Jazz Photography Of Chuck Stewart is on exhibit through March 31, 2016 at the WBGO Art Gallery. There's a Gallery Reception TONIGHT, March 24, 6PM - 8PM that is FREE and open to the public at the WBGO Art Gallery in Newark, NJ. Regular visiting hours are Monday through Friday, 9AM to 5PM. Chuck Stewart has been an eyewitness to 20th century American social, cultural and musical history. He photographed over 2,000 album covers for record labels large and small including Mercury, Argo, Impulse, Chess, Atlantic, Columbia Records and more. On his website, Stewart describes his work, "In my portraits and improvisational shots, I've tried to unveil the soul of the artists I photographed and communicate the essence of their craft. That's why they trusted me: James Brown, John Coltrane, Candido, Miles Davis, Eric Dolphy, Judy Garland, Billie Holiday, Quincy Jones, Machito, Max Roach, Frank Sinatra, and many more. You know their names, but few people have known and photographed them as I have. My pictures and I have many stories to tell."